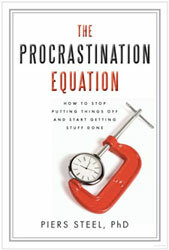 Piers Steel’s new book The Procrastination Equation made its way to my door last week. I’ll admit, the title taunted me to put off reading it — it’s as if just seeing the word procrastination could create a self-fulfilling prophecy — but, I didn’t. I finished it three days after first picking it up. Steel has produced an exhaustive look at the research, history, definition, forms, and treatment of procrastination. (Note: Exhaustive may be underselling it, as there are 73 pages of endnotes following the 220 pages of manuscript.) The research, history, and forms of procrastination sections of his book are its strength and most captivating. Until I read Steel’s book, I had no idea ancient Egyptians had eight hieroglyphs referring to delay, one of which specifically implies neglect and/or forgetfulness. Procrastination clearly isn’t a new problem created by modern workers’ addictions to Facebook. Although, I also learned from reading the book that Facebook has such an addictive draw that half of people who personally close their accounts reactivate them. By procrastinating you are not just delaying, though delay is an integral part of what you are doing. Procrastination comes from the Latin pro, which means “forward, forth, or in favor of,” and crastinus, which means “of tomorrow.” But procrastination means so much more than its literal meaning. Prudence, patience, and prioritizing all have elements of delay, yet none means the same as procrastination. Since its first appearance in the English language in the sixteen century, procrastination has identified not just any delay but an irrational one — this is, when we voluntarily put off tasks despite believing ourselves to be worse off for doing so. When we procrastinate, we know we are acting against our own best interests. He identifies motivation as the opposite of procrastination, and that a lack of motivation is a result of troubles with expectancy (such as you expect to fail at the task, so you don’t do it), value (such as you don’t value the work you’re supposed to do, so you don’t do it), or impulsiveness (I explain this one in more detail below). The book provides tips for overcoming these three roots of procrastination with “action items.” If you’ve read any books or articles on procrastination in the past, the suggestions Steel provides are all ones you’ve seen before: Watch inspirational movies, visualize a positive outcome, identify that you’re procrastinating, positively frame outcomes, do hardest work when you are most alert, keep up your energy levels, reward yourself for reaching milestones, remove temptations and distractions, use specific language when setting goals, break down long-term goals into multiple milestones, schedule time for tasks, etc. In fact, I don’t think there are but one or two tips we’ve never covered on Unclutterer. As I mentioned earlier, though, the “action items” wouldn’t be why you would read the book. It’s the first part of the book exploring the research, history, and forms of procrastination that make this book worth your time. People who act without thinking, who are unable to keep their feelings under control, who act on impulse, are also people who procrastinate. Delayed gratification isn’t an option for many procrastinators. If given the choice between watching television or studying for a test, they’ll watch television because it will be instantly gratifying. Even if performing well on a test will be more gratifying, they are unable to ignore the temptation in the present. I had never thought of procrastination as an impulse control issue until reading Steel’s book. This discovery will certainly color (for the better, I hope) my future advice about fighting procrastination. The connection between procrastination and impulse control is really illuminating. Thanks so much for this thoughtful article, Erin. Sounds interesting! Does Steel also talk about *why* people procrastinate? There was a time when I needed to have talks with a psychologist to untie some knots and in that process I was told that my primary mechanism of self defence is procrastination. First step is to become aware of this behavioural pattern, second to start training myself into noticing when I’m doing it again, third to practice mindfulness in an attempt to learn to focus better. At least in my case it’s not just procrastination, but something much deeper and therefore it is not very productive – or kind toward myself for that matter – to go on a guilt trip. What does he offer as a tool to control this unproductive state of mind (in the sense that we’re not doing what we know should be doing according to what we have decided would be beneficial in reaching our ultimate goals)? The book goes on my wish list, thanks for the review! Oops, I missed one paragraph where you write about his tips. Sorry. Wow! Going on my book read 2011 list asap. I procrastinate due to feeling overwhelmed, hoping this will unlock some motivation! Thanks! @Jo — Feeling overwhelmed is addressed in detail in the “expectancy” sections of his book. There is definitely a lot to be learned from those chapters. I wish Erin or Piers Steel had addressed my question somehow. Procrastination is a true problem if it has a deep, underlying reason and some list of steps what to do might not solve a thing. In my own case, I procrastinate because of my fears related to a test (which in turn relates to the end product; the profession of someone who has more responsibility over life than any other group of people – that of a doctor) and this is a pattern that has followed me over many years. I’m not surfing the net instead of studying for instant gratification, I’m doing it because of the complexity of my fear, because it in that moment seems easier to shovel the rough stuff under the carpet. This fear is something I know that many others fear with me and it’s real for those who procrastinate as a first step to deal with hardship. I’ll look elsewhere for support. Oh, that one fits me perfectly! If I’m stalling at anything, I’ll do half a dozen other things that I really hadn’t wanted to do. I’m justifying procrastinating on the worst task because I’m getting done a handful of other slightly less dreaded tasks. I have noticed that the more I declutter my life, the less I procrastinate about other things. Unfinished chores that I used to use as a distraction from bigger tasks tend to already be done, since having them undone looks like clutter to me now. Thanks, Leslie, I’ll look into that one instead. I read Procrastination by Burka and Yuen and found it to be helpful. I also recommend, for those who think it might be relevant, Get It Done When You’re Depressed by Fast and Preston. I have ordered this book as well, I can always use some more help with procrastination. I’m doing it now! Thanks for the review, Erin. This book is already on my TBR list, having read a couple of Piers Steel’s earlier papers. I’m very interested by ninnak’s comments on the roots of procrastination. Obviously, Steel’s work doesn’t address this directly, but what it does do is tease apart the components of procrastination and shows how they interact. When it comes to why you in particular are procrastinating over some particular thing, the equation is the obvious place to start looking at your personal psychology. It leads us naturally to insights such as the one regarding impulse control and allows us to dig deeper from that point into individual psychopathology. I can see how Steel’s work would provide a valuable tool for therapists, a great springboard into a more structured analysis than was previously possible. I was going to write something relevant but maybe I’ll just do it tomorrow. So decluttering your house of impulse causers leads to less procrastination… a true eye opener, and yet with hindsight, so obvious. I’m glad I got rid of the television years ago, but now internet is an easy time consumer. And there is food, daydreaming, computer games, to take a bite off the rest of the time I have left. I just bought The Now Habit: A Strategic Program for Overcoming Procrastination and Enjoying Guilt-Free Play, an older book about procrastination. Making my way thru it. I read this great quote the other day (maybe here? I neglected to note where)– “Procrastination is a displacement activity: we do just enough to satisfy the need to act without acting at all.” That is helping me significantly, in identifying the underlying reasons that I am not getting things done. Food for thought! @ninakk: I would argue that you need not look too much farther for support than yourself. Identifying the problem, as you have, is a MASSIVE step in overcoming it. I hope that you have celebrated that! I too suffered from procrastination in University. For me it was in getting term papers in on time. Intellectual ability was highly prized in my family and I felt that a term paper was the way that my intellectual ability would be judged. Talk about pressure! I only figured this out near the end of my time, but once I identified, I could start to enumerate other ways that I was valuable and that took some of the pressure off of me. Want to thank Dr Steel for his work. True, that most of the tips are found somewhere or the other in the motivation/procratination resources, what helped me immensely is the formula. Truly my life changing moment. I put it in excel sheet and realised right away that no point in working on something till dont put a high rating on Expectancy ( or self efficacy) and value that I put on task and reduce the rating on impulsiveness and Delay. I also made a formula of my own after that for post-task analysis and these two indices helped me wade through.